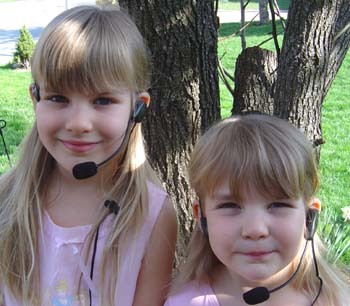 wearing Ultra headsets included with system. Can the system be used with two single bikes or with a tandem? Yes! The system works great with the units in close proximity or up to 1/4 mile under ideal conditions. Riding with a full duplex system (two live channels) permits normal conversation as if you were sitting next to each other. There are no buttons to push as on a walkie-talkie unless you set it up that way. You can enjoy increased safety and enhanced communication when riding a tandem or single bikes. 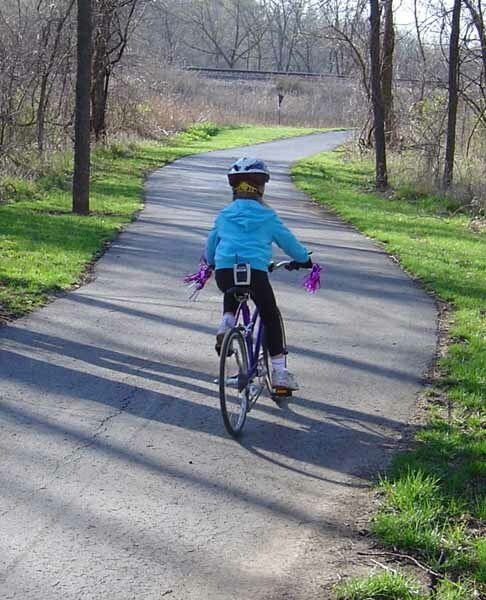 Think of the increased safety when riding with children on the trail or road. CLICK HERE for a picture of a child riding riding a single bike. Why is the Ultra Headset so comfortable? The small speaker sits outside of the ear and there is NO earbud in contact with the sensitive tissue in or around the auditory canal . The headset remains in place via a simple loop that goes behind the head and placed over the ears, like putting on a baseball cap. The Ultimate Headsets have cords made to our specifications thus vastly improving ease of use, comfort, cord durability, and cord length issues. Will the Ultra Headset block out normal hearing? No. The external speaker design does not seal off the auditory canal. You will hear ambient traffic sounds and be able to carry on a conversation with a rider next to you without difficulty unlike ear bud type headsets. And if you think about it, traffic approaching from the rear is heard by both ears. Is riding in the rain a concern? We suggest carrying a Ziploc bag in case of a true downpour to provide protection for the entire system. Excessive moisture from a soaking rain could potentially cause damage. Should your unit inadvertently become wet, turn the unit off and let it dry with the battery cover removed for 3 or 4 days before turning it back on. Remove the microphone cushions during this time as well. Does the Tandem-Com Digital Wireless have a warranty? 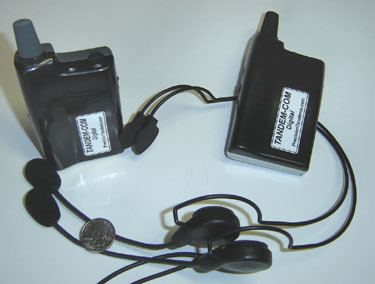 The Tandem-Com Wireless and the Ultra Headsets are guaranteed to be free from defects in materials and workmanship for a period of 90 days from the date of purchase. Should you experience difficulty with your unit, call us at 913-962-8866 to discuss your concern. Items returned without authorization are refused. Can two people talk at the same time? Yes! Conversing is identical to being in the same room with someone thanks to the full duplex design. Both mics are live all the time when the talk buttons are engaged. May the system be used as a push to talk talk system? Yes. You may use the system as a PTT to extend battery life and to have private conversations too without the person having the other radio being able to hear. What are the technical specs of the Tandem-Com Digital Wireless? May I play music through the wireless system? Yes, if you make your own stereo 3.5mm (1/8") patch cord and add a 2.7k resistor to the music source side. Will the Tandem-Com Wireless interfere with other wireless devices on my bicycle? It is possible. The digital Wireless system uses 2.4GHz technology. We have received a single report (01/12) of interference with the function of Garmin bicycle mounted electronics that are said to use the same frequency. Hear your own amplified voice when you speak? Can three, four or more radios be used at the same time? Yes but it works like an instructor in a classroom. Any number of people (Remotes) may listen to one person (the Master). Only one Remote at a time set in the talk position may talk back to the Master while in full duplex mode. In other words, the Master may instruct one Remote to turn the talk feature Off and instruct another to turn theirs On. If the Master instructs Rider B to switch their Talk button to the Off position and then instructs Rider C to turn theirs On, then rider C is now in full communication with the Master. All other riders (no matter the number) will continue to hear the Master like an instructor in a classroom where you are able to talk only when called upon. Will others with a Tandem-Com Digital Wireless hear us? Only if are set to the same channels and the chance of that happening is very remote. The units have dip switches so you may select a random frequency similar to that used in garage door openers to provide security. The switches provide a huge number of privacy channel combinations. If you change from the factory seeing, the chances of some one hearing you is probably the same probability of a neighbor opening your garage door with their remote. A few months ago I purchased the digital wireless intercom system hoping to use it on our snowmobile as well as our tandem. Unfortunately the headset would not fit in the snowmobile helmets. This week we did have a chance to try the system out on our tandem, on vacation in Arizona. Wow! We love them. What a different and pleasant experience it is to be able to talk to one another without yelling or turning to communicate. This tandem intercom was worth every penny and I would highly recommend them to anyone. We have yet to try them while riding single on our mountain bikes but I'm sure they will be just as much fun. and we both really like it. it is great to be able to just talk and not yell over my shoulder. Well now that I have used the Wireless , I have to say it is a neat deal. the excellent customer service from you folks when I had a question.